(Space.com) Even TV comedian Stephen Colbert isn't immune to the excitement surrounding the historic upcoming landing of NASA's newest rover on Mars. The huge Mars Science Laboratory, also known as the Curiosity rover, is slated to touch down on the Red Planet on Aug. 5 at 10:31 p.m. PDT (1:31 a.m. EDT Aug. 6; 0531 GMT). The rover's thrilling descent through the Martian atmosphere is so complex that it has been nicknamed "the seven minutes of terror." 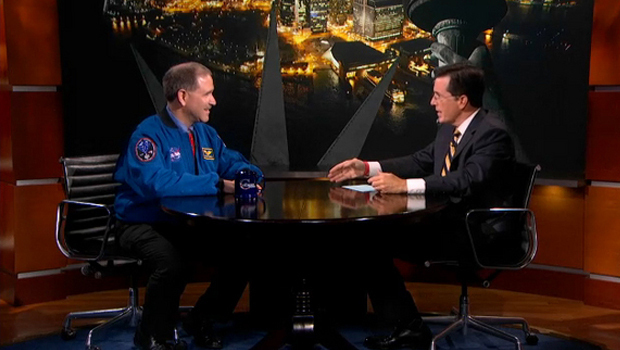 John Grunsfeld, a former veteran astronaut and NASA's associate administrator for science missions, spoke to Colbert about the Curiosity rover's landing Wednesday (Aug. 1), during an appearance on Comedy Central's hit late-night faux-conservative news show "The Colbert Report." With the help of an animated video of Curiosity's landing, Grunsfeld detailed the steps involved in the rover's harrowing journey to the surface of Mars. "As it enters the atmosphere, it will start slowing down," Grunsfeld explained. "It will reach about 10 Gs of acceleration." "That's not science fiction -- that's really going to happen on Monday," Colbert said following the animation. Curiosity's descent through the atmosphere of Mars will be completely automatic, with mission controllers on the ground unable to intervene during any part of the complex procedure. This prompted Grunsfeld to joke that famed Apollo 11 astronaut Neil Armstrong, the first man on the moon, will not be present to help maneuver the car-size rover to the Martian surface. Grunsfeld also explained that news of the landing will likely be delayed by at least 14 minutes, which is the time it takes for a signal from Mars to reach Earth. "That's faster than NBC can tell us what's happening in London. That's impressive," Colbert joked, referring to ongoing complaints among TV viewers in the United States about NBC's tape-delayed coverage of the 2012 Summer Olympics in London, England. NASA's Curiosity rover, which will carry a suite of 10 instruments with it to the Red Planet, is designed to search for evidence that Mars has (or ever had) an environment suitable to sustain microbial life. It is the most ambitious robotic planetary mission the agency has attempted to date. "This is the first mission where we've sent an organic chemistry laboratory to the surface of Mars," Grunsfeld said. While Curiosity is not specifically designed to spot aliens, Colbert and Grunsfeld both agreed that if life is ever found on Mars, it will be an Earth-shattering discovery. "It makes you wonder," Colbert said with a smile. "Genesis. It wasn't until the fourth day that God created any living creatures. And then on the fifth day, it was animals, and the sixth day it was man, and then it said on the seventh day he rested. Maybe that's a lie. Maybe he went to Mars." Grunsfeld said the Curiosity rover may not be able to definitively answer the question of whether life exists elsewhere in the universe, but the robotic explorer's mission still represents a giant leap for mankind. "Whether there's life elsewhere is the big, fundamental question," Grunsfeld said. "This is a big step -- a big step in that direction."